We’d love your help. Let us know what’s wrong with this preview of How to Set Yourself on Fire by Julia Dixon Evans. "It’s not romantic," Torrey says. "It’s physics. For every letter there is an equal and opposite, you know…letter." Sheila’s life is built of little thievings. Adrift in her mid-thirties, she sleeps in fragments, ditches her temp jobs, eavesdrops on her neighbor’s Skype calls, and keeps a stolen letter in her nightstand, penned by a UPS driver she barely knows. Her mother i "It’s not romantic," Torrey says. "It’s physics. For every letter there is an equal and opposite, you know…letter." To ask other readers questions about How to Set Yourself on Fire, please sign up. This quirky novel about a listless thirty-something woman, the 12-year-old girl she befriends and a box of mysterious letters is such a hidden gem. When Sheila’s grandmother Rosamond dies, she leaves behind a box of 300+ love letters from a man named Howard, an old neighbor of hers with whom she may or may not have had an affair. Sheila’s life is at a standstill. She’s obsessed with a UPS worker who she’s been stalking for a few years now. She’s barely employed. She’s depressed. She’s weird as hel This quirky novel about a listless thirty-something woman, the 12-year-old girl she befriends and a box of mysterious letters is such a hidden gem. Sheila’s life is at a standstill. She’s obsessed with a UPS worker who she’s been stalking for a few years now. She’s barely employed. She’s depressed. She’s weird as hell. Her only friend is her neighbor, Vinnie, a taxidermist whose preteen daughter, Torrey, comes to live with him after her mother dies in a freak skydiving accident. Sheila and Torrey befriend each other, bonding over their mutual interest in the box of letters. Together, they read through them and try to piece together the story of Howard and Rosamond. The problem is that they only have Howard’s letters, so they have no idea what was going on on Rosamond’s end. Sheila, Vinnie and Torrey are such strange and well-drawn characters. Their interactions with each other are unconventional, funny and surprisingly tender. They fill voids in each other’s lives, not unlike Rosamond and Howard. When Vinnie and his daughter Torrey suffer a tragedy, Sheila slowly begins to befriend the young girl and it’s painfully and beautifully awkward. She is beyond rusty when it comes to people, relationships. Her grandmother’s affair saddens her, knowing the choice she made and how her life played out, that she is the legacy, a mess of a granddaughter, directionless, unable to anchor anywhere. Her family has issues with bonding, unable as a child to dare ask her mother where her father is, why he isn’t in their life any longer. Her mother always a bit cold, distant, unable to be the sort of mother we all hope for. Sad more for never really knowing her grandmother than about her passing, her mother trying to contain what she sees as her mother’s ‘shameful’ secret by not honoring her last request, unaware that through the letters Sheila knows everything. There is a moment in the novel when Sheila sees a picture, a favorite of her mother’s with her own parents, one that shows how much Sheila and her mother looked alike as children. She says “It almost hurts how much she looked like me. I want to be as different from her as possible and she wants to be as close to me as possible.” The lines are a gut punch, and hint at the damaged mother/daughter relationship. Nosing through her grandmother’s letters, she begins to understand her own mother’s relationship with her grandmother Rosamund. Working temp jobs, she has a special gift for working even that system. She isn’t exactly respectable, in fact seems to struggle with being an adult altogether. Interacting with Vinnie after an accident involving his ex-wife, her tasteless questions expose her social ineptidue.She doesn’t mean to be so ridiculously clueless, such a mess. I spent so much of this novel cringing from her behavior, which is why I loved it so much. It’s hard to relate to perfect characters, I have a weak spot for the wounded, for strays. I adore the relationship between she and Torrey. Torrey is happy to join the quest in finding out if Harold is still alive, if Rosamund’s letters to him still exist. Unlike other fiction, it stays in the realms of reality, where not everything turns out the way you expect it. Through Torrey’s savvy, there could be a way to locate this Harold, but like Torrey tells her when she proposes the idea and Sheila isn’t ready, ” You’re weird. You do things weirdly.” Sheila is a strange bird, her inheritance is pretending everything is normal as the roof caves in. For me, the letter she cherishes that isn’t hers to hoard, that belongs to the UPS man, that is like a drug for her says more about her state of loneliness and need. It leads to a strange obsession that is important to the novel, yet not the entire center of it. It is through Torrey she starts to abandon her quiet life, begins to see the real problem lies within herself, even if her mother shoulders a fair amount of the blame. At what point do we move on and stop blaming others for who we have become? Vinnie is important too, they begin a relationship too, minus strings and while he is mostly on the periphery of the story, he has his big moments, particularly toward the end. The most important relationships are between all the women. The bonds are imperfect, but there could be room for healing. A moving story about a woman who is stunted, until her grandmother’s past affair and precocious young neighbor inject life into her. Lovely. Such a deeply affecting novel. Evans has created something compelling and heartbreaking with her main character, Sheila—a woman who's unapologetically grotesque yet perennially wanting acceptance. A woman insecure with how she presents herself to the world, yet will only meet the world on her own terms. A dirtbag without an excuse. She's a frustrating, refreshing, brave character. When Sheila befriends her neighbor's kid, Torrey, and the two set out to solve a mystery of sorts, it would be easy Such a deeply affecting novel. Evans has created something compelling and heartbreaking with her main character, Sheila—a woman who's unapologetically grotesque yet perennially wanting acceptance. A woman insecure with how she presents herself to the world, yet will only meet the world on her own terms. A dirtbag without an excuse. She's a frustrating, refreshing, brave character. What's more, this novel is a profound examination of the quiet tragedies that are passed down within families, inescapable like genetic diseases. - A soft series of gutpunches at the money scenes. - A reassessment of the tragedies in your own family. - A desire to write more letters by hand. - Reinvigorated fear of ants in your laundry. - Heart-swelling fondness toward all the parts where the balance in Sheila's life tilts toward insanity. - A renewed faith in the eroticism of PBS. I have to admit something right off the bat. On paper, reading the back cover description of this book there is no way I would normally have chosen to read this book. I would have shaken off the idea as just not for me. The old saying about judging books by their cover can be extended to many aspects of books which are complete experiences. I read this book because frankly I like Julia. She is a San Diego writer and yeah I naturally root for San Diego writers. I have read a few of her stories an I have to admit something right off the bat. On paper, reading the back cover description of this book there is no way I would normally have chosen to read this book. I would have shaken off the idea as just not for me. The old saying about judging books by their cover can be extended to many aspects of books which are complete experiences. I read this book because frankly I like Julia. She is a San Diego writer and yeah I naturally root for San Diego writers. I have read a few of her stories and they have all been great. More importantly for me I have seen Julia read/ perform her fiction before and I started this book knowing absolute zero about the plot. I got it and read it purely on the strength of the author. Now that said I would LOVE, LOVE, LOVE to see her tackle a horror novel, I mean she has written some great horror short stories but it doesn't matter HTSYOF is a excellently written character focused novel. Set here in San Diego this novel is the story of Sheila who struggles with life a little. She is temp who hates working and is reeling from the death of her Grandmother. Her life is thrown upside down when she finds a box of extra martial love letters in her Grandmother's shoe box. Before these letters the most exciting thing in her life was masturbating to PBS and ease dropping on her neighbor Vinnie's skype calls with his daughter on the east coast. For hilarious reasons Vinnie's daughter ends up moving out west to live with her father. She and Shelia strike up a friendship over the love letters and finding her Grandmother's long lost love Harold C. Carr. I want to note that for some reason I pictured the Character of Vinnie, as Vinnie Paul of Pantera which made some turns with the character hard for me to take but that is a me problem. OK back to How to Set Yourself on Fire. So yes Sheila is not exactly what I would call a winner, but she is such a excellently written character as are all the side characters in the piece. Vinnie, his daughter Torrey and Sheila's cringe inducing mother all make this book a page turning experience. I think the weird thing is that this is somewhat of a coming of age novel even though the main character is an adult. Shelia has alot of growing to do. The most effective moments of writing are found in the moments of parallels, found between Shelia and the letters. Shelia wanted to believe in the romance as much as Harold Carr did. It is not her love story on the surface but it doesn't make it any less heart-breaking. There is a love story here, not a romantic one but Sheila, Vinnie and Torrey come together in a way that is heartwarming. A less talented writer would have spelled out this happy ending, but Julia Dixon Evans is to good a storyteller for that. I loved this book. Equal parts tender and funny, relatable and lovely. I identified so much with the protagonist's difficult relationship with her mother. I loved the interweaving plotlines. Wonderful story beautifully written. What really caught my eye about this book, was the cover and the title. It seemed so mysterious, like it could be about anything and I would enjoy it, and I'm really glad I got the chance to read it. In reality, it's a super relatable story about a woman named Sheila, who's only family is her cold mother, and her grandmother. She doesn't have any friends, and like her temp jobs, the rest of her life seems to be quite on and off. That's the way she likes to keep things. It begins with a call from Sheila's mother, asking her when the last time she saw her grandmother was, and that she should probably go visit her within the next couple days. She's very old, and close to death. When she visits her, she tells her that history repeats itself, and more importantly, that it never forgets. She says that she wants to give her something, but that it can wait until tomorrow. The next day she gets a call from her mom and she says that she's gone. She has a tendency to lie to her mother to keep her in good terms, to keep her from worrying, and when she asks if she saw her the day before, tells her no. This is the beginning to a book that I can't stop thinking about. The characters in this book are so real, and they have problems of their own to work out. It follows Sheila in her day to day world, through her point of view, and most of the time she's just reading through her grandmothers old letters. This book is such an easy and enjoyable read, it's just really real and I'm so glad I got the chance to read it. Sheila eventually makes friends with her neighbours, Vinnie and Torrey, and finds out how to live. I absolutely loved this book, and I would love to get a copy of it for my shelf to read again and again. I have nothing bad to say about this book, and I definitely think everyone should at least check it out, it's really worth your time. Here's a link to the book on Amazon, and another link to the author's Twitter. Quiet and exquisitely written, this debut tackles the biggest topics -- family secrets, inheritance, romance, narrative itself -- from the perspective of an unstable thirty-five year-old living in one of the cheapest dwellings in San Diego. Julia Dixon Evans offers us a group of characters trying to overcome the isolation of modern life by pursuing the stories that just might save them. This was just such an awkward and odd love story and it completely was a love story. Mostly it was Horalds and everyone else was just a part of the story that was happening. There was a small group of characters throughout this book and they were all written just so perfectly human. They were flawed in almost every possible way and it was amazing. I wasn't sure what I was expecting from this book and it's been a while since I've read a book like this, but I honestly enjoyed every minute of it. Do you love those slow-burning, complex human dramas that take you on a trip so fully into the lives of their characters? The kind that show multifarious human beings trying - often failing - and trying again to do their best? Julia Dixon Evans spins a carefully crafted tale, and if it sounds like I'm not trying to give too much away, its because I'm not. This is a novel to dive into with few expectations because the reward is in the reading - approaching each sentence and paragraph as it's a sm Do you love those slow-burning, complex human dramas that take you on a trip so fully into the lives of their characters? The kind that show multifarious human beings trying - often failing - and trying again to do their best? Julia Dixon Evans spins a carefully crafted tale, and if it sounds like I'm not trying to give too much away, its because I'm not. This is a novel to dive into with few expectations because the reward is in the reading - approaching each sentence and paragraph as it's a small present to be unwrapped and tucked away for a story that both breaks you and puts you back together, again and again. I thoroughly enjoyed the time I spent in the mind of Sheila, the protagonist, a socially isolated woman in her mid-thirties who can't seem to hold down a job and is avoiding her mother because of a secret and a lie she told. The secret is a box of letters addressed to Sheila's recently deceased grandmother, Rosamond—letters she told her mother she had put in the coffin. The letters are from Rosamond's neighbor, Harold, and seem to reveal a romantic affair. Sheila spends her time dwelling on the I thoroughly enjoyed the time I spent in the mind of Sheila, the protagonist, a socially isolated woman in her mid-thirties who can't seem to hold down a job and is avoiding her mother because of a secret and a lie she told. The secret is a box of letters addressed to Sheila's recently deceased grandmother, Rosamond—letters she told her mother she had put in the coffin. The letters are from Rosamond's neighbor, Harold, and seem to reveal a romantic affair. Sheila spends her time dwelling on the letters and occasionally doing further investigation with her twelve-year-old neighbor, Torrey. A beautiful, nuanced, tender novel told through razor-sharp wit and eagle-eyed characterization. Particularly affecting to this reader was the relationship between Sheila and her mother, but there is much to connect to here. Not an easy thing to accomplish, especially in a first book. I'm excited for whatever she does next. I didn't realize something could be this beautiful. HOW TO SET YOURSELF ON FIRE is a tender, fucked-up book about traumatized people trying to find beauty in a burning world. A million stars. Buy it. I received this book from Dzanc books in exchange for an honest review. This did not influence my opinion in any way. Sheila visits her grandmother the day before she passes away. Her grandmother mentions a shoebox, but tells Sheila she will explain more about it tomorrow. For Sheila's grandmother, tomorrow never comes as she passes away the next day. Sheila investigates the contents of the shoebox and discovers hundreds of letters addressed to Sheila's grandmother from a mysterious man called Harold C. Carr (who isn't her grandfather). Sheila explores this mystery with her neighbor Vinnie's daughter and develops a friendship with her (and somewhat of a relationship with Vinnie) along the way. I rated the book four stars because it is beautifully written with characters that are very alive and vivid - even if I couldn't relate to any of them. Actually, I find the main character, Sheila, to be very disturbing and plain creepy. (view spoiler)[ She stalks a man she had had a crush on few years ago. She is not able to hold a job or to pay her bills. She kinda blames her being so screwed on her father who left the family the night before her confirmation and her emotionally distant mother. I rated the book four stars because it is beautifully written with characters that are very alive and vivid - even if I couldn't relate to any of them. Actually, I find the main character, Sheila, to be very disturbing and plain creepy. (view spoiler)[ She stalks a man she had had a crush on few years ago. She is not able to hold a job or to pay her bills. She kinda blames her being so screwed on her father who left the family the night before her confirmation and her emotionally distant mother. However, if every kid from a broken family would have been that messed up, the world would have been an asylum. A woman tries to navigate her messy life with the help of neighbors and letters that were left behind by her grandmother. 2018 is becoming the year of the apathetic female protagonist. Sadly, I don't think this book will get as much attention as The Pisces or My Year of Rest and Relaxation, but it should and could. It completely fits in with the trend of female characters that allow it all to hang out and don't really care about the fact that it is. They are and aren't books of self-improvement. A woman tries to navigate her messy life with the help of neighbors and letters that were left behind by her grandmother. 2018 is becoming the year of the apathetic female protagonist. Sadly, I don't think this book will get as much attention as The Pisces or My Year of Rest and Relaxation, but it should and could. It completely fits in with the trend of female characters that allow it all to hang out and don't really care about the fact that it is. They are and aren't books of self-improvement. They all end with hope, but not with a fix to the problems. 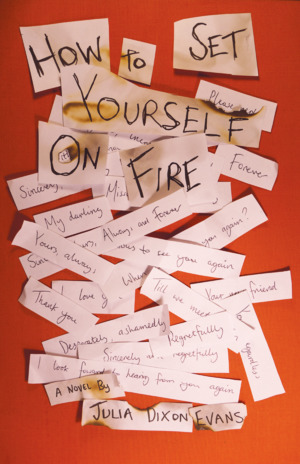 When I finished How to Set Yourself on Fire, I asked myself what I gleaned from it. The answer was nothing except perhaps a celebration of dysfunction. I must have missed something in that other reviewers here saw because I thought the entire story utterly pointless. 3 stars, low C- but only because there are a (very) few good insights. A strange book about a lonely person. Sheila occasionally does temp jobs, but spends most of the book unemployed, hanging around at her dumpy little apartment. It reminded me of Lonely by Emily White, which is a nonfiction book that is half autobiographical and half scientific study. Similar subject matter, in the end. It was a good book, all things considered. I really enjoyed this book. There's something about Sheila—the protagonist and narrator—that I just found riveting. Something in the way that she is so consistently self-destructive, the way that she's both self-aware and not. She strikes me as simultaneously just barely held together but also in a way very confident in who she is. Really interesting, I thought. This is one of the best books I’ve read in ages, and I read voraciously. It is so well written, so captivating and unique. I love the characters and their complicatedly authentic lives. And I love the story line and premise for the novel - it was very hard to put it down and not keep reading it all at once. An incredibly talented writer. Strange characters. Flawed human beings being flawed human beings. And yet totally loveable at the same time. I liked Sheila a lot despite her penchant for being a liar. It's understandable. There's some heavy intergenerational trauma going on. Not a book I would normally pick up (I think it came up in my Goodreads feed!) But I really enjoyed it. It sucked me in very quickly.